Cellular growth and differentation are controlled by multiple extracellular signals, many of which activated the Ras/mitogen-activated protein (MAP or ERK) kinase cascade. Ras directly interacts with and activates Raf. Raf phosphorylates and activates MEK, which in turn phosphorylates and activates ERKs. The receptor tyrosine kinase effector, Raf, named for Rapidly Accelerated Fibrosarcoma, was discovered over two decades ago by two groups independently as a retroviral oncogene, v-Raf or v-MIL, possessing a serine/threonine kinase activity. This serine/threonine kinase was later found to function in the linear Ras-Raf-MEK-ERK mitogen activated protein kinase (MAPK) pathway with an intricate regulation. The Ras-Raf-MEK-ERK mitogen activated protein kinase (MAPK) pathway is activated by growth factors, mitogens and antigen receptors, by GPCR activation, by stress and infiammatory stimulus, by UV, FASL activation directly and by the activation of G-coupled receptor that switches on Calmoduline signal Ca++-citoplasmatic-dependent induced by PLC. For these reasons the activation of MAPK pathway is an indicator of a "good state" of the cell because it is involved in pro-proliferation and pro-survival response. Besides their established role in tumorigenesis, Raf proteins and the MAPK pathway have been shown to play key roles in various “normal” physiological processes as diverse as cellular metabolism, cell cycle progression, cell death and neurological function. RAS GTPases are activated by the majority of growth factor receptors and bind and recruit Raf to the cell membrane upon activation. The central components of Raf, MEK and ERK signaling are then sequentially phosphorylated and activated by each other. More than 70 nuclear and non-nuclear effector molecules of the mitogenic cascade have been identified so far. In addition, Raf kinase signaling in a cascade-independent fashion has been described. This includes the activation of the NF-kB transcription factor, the prevention of apoptosis by antagonizing proapoptotic factors such as MST2, the mammalian sterile 20-like kinase, ASK1, the apoptosis signal-regulating kinase1, and BAD, the BCL-2-antagonist of cell death, and finally the positive regulation of cell migration via the Rho effector kinase Rok-a. The regulation of Raf kinase activity is quite complex, far from being fully understood. The key feature involves assembly of the cascade at the membrane from preexisting modules (Ras module, Raf module, KSR module). This process is paralleled by an intricate pattern of phosphorylation and dephosphorylation events leading to conformational changes of signaling molecules. The kinetics of this process depends on the presence of individual Raf isoenzymes and on the engagement of various positive and negative feedback loops. Primarily the phosphorylation status and the localization of Raf kinases determine the association with interacting partners, such as chaperones, other kinases, prolyl isomerases, phosphatases, scaffolding proteins and also lipids and vice versa. Within this signaling zoo along the mitogenic cascade, there is still more room for novel players. They are definitely more than just additional signaling proteins and contribute significantly to our understanding how Raf kinase signaling really works. Homo- and heterodimerization of Raf kinases clearly exist, and that heterodimerization can be Ras induced. In addition, it was shown that Raf heterodimerization is regulated by 14-3-3 proteins, mitogens and the Mixed-lineage kinase 3 and is also stabilized by MEK inhibition. Several authors described that heterodimerization is involved in the activation of C-RAF by B-RAF, but that wild-type and mutant B-RAF use different activation mechanisms. Whereas wild-type B-RAF activates C-RAF via RAS-induced heterodimerization, mutant B-RAF heterodimerizes with and activates C-RAF in a RAS-independent manner, thereby generating a novel B-RAF > C-RAF > MEK > ERK pathway that is active in normal as well as in transformed cells. 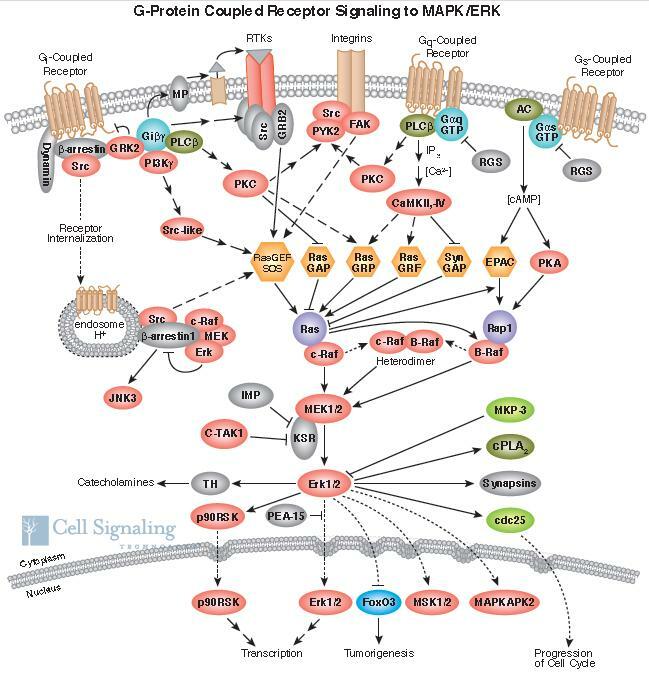 Whether signaling via this pathway just reflects some sort of crossactivation of Raf isoforms or whether it leads to a different set of effector functions in comparison to the classical RAF > MEK > ERK cascade remains to be determined in future. Since its first isolation as a potential cellular oncogene, many studies involving Raf were focused on its role in cancer. These included examining both its direct role in cancer and its involvement in mediating transformation by its upstream effectors, especially Ras and growth factor receptors. Most of understanding of Raf regulation comes from studies using C-Raf, though several fundamental studies using B-Raf have also provided significant input to view of this complex process. C-Raf is a 648 amino acid protein migrating on SDS/PAGE as a ~75 kDa polypeptide. There are several regions conserved among all Raf proteins designated CR1, CR2, and CR3. The transforming v-Raf form contains a deletion of CR1 and CR2, resulting in a constitutively active form of Raf. Thus, the N-terminal half of Raf is considered to be a negative regulatory domain which helps in maintaining Raf in an inactive state in the absence of stimulation. The common view is that the catalytic domain of Raf is folded and bound to the N-terminal regulatory domain. This interaction is stabilized by the binding of a 14-3-3 dimer at two C-Raf phosphorylated sites, S259 and S621. As to the Raf activation process following the interaction with active Ras, the common thinking is that C-Raf undergoes a series of phosphorylation and dephosphorylation events that result in a stably active form. This aspect of Raf regulation turned out to be a highly challenging task to tackle and remains only partially resolved. Many of the studies on Raf and the entire MAPK pathway have focused on experimental models using acute growth factor activation (high concentrations for a short time period). These models do not reflect physiological conditions in the organism, in which acute growth factor exposures are highly rare events. Thus, the function of the pathway under “normal” growth conditions is fairly unknown. Furthermore, one would expect that these functions would be largely cell type and organ specific. In this regard, even our understanding of the role of Raf and the MAPK pathway in a relatively defined biological setting of cell cycle progression is considerably limited and even less known are isoform specific Raf functions during this process. As regards to the role of Raf in cancer, though B-Raf is distinguished at present as the principal Raf isoform associated with human cancer due to the prevalence of its mutations, these cancer cases overall represent only a small fraction of human cancers in which Raf may play a key role. The large majority of cancers that involve increased MAPK activation do not carry Raf mutations (e.g., cancers with mutant Ras or growth factor activation). Thus, in these settings it is important to define the relative contribution of the three Raf isoforms in the tumorigenic process. Thus far, many of the experimental approaches involved the use of dominant negative Raf forms that function largely by inhibiting Ras or MEK and are not informative in determining the role of Raf in these settings or distinguishing between isoform specific functions. Similarly, the existing small molecule Raf inhibitors do not differentiate between the three Raf isoforms. The main tool to address this question is the use of RNAi reagents specific for each Raf isoform. However, even this approach may not provide conclusive answers when considering the recent reports that C-Raf and B-Raf could act in concert through heterodimerization, though the physiological significance of these observations awaits further confirmation. The role of Ras–ERK signaling in behavioral plasticity is well established. Inhibition studies using the blood–brain barrier permeable drug SL327 have conclusively demonstrated that this neuronal cell signaling cascade is a crucial component of the synaptic machinery implicated in the formation of various forms of long-term memory, from spatial learning to fear and operant conditioning. However, abnormal Ras–ERK signaling has also been linked to a number of neuropsychiatric conditions, including mental retardation syndromes (“RASopathies”), drug addiction, and l-DOPA induced dyskinesia (LID). The work recently done on these brain disorders has pointed to previously underappreciated roles of Ras–ERK in specific subsets of neurons, like GABAergic interneurons of the hippocampus or the cortex, as well as in the medium spiny neurons of the striatum. Here we will highlight the open questions related to Ras–ERK signaling in these behavioral manifestations and propose crucial experiments for the future. Dominant-negative Raf kinase, which broadly binds to and inhibits Ras family members and related GTPases, suppresses epidermal growth factor-induced extracellular signal-regulated kinase and c-jun N-terminal kinase (JNK) activation in RA FLS, and reduces constitutive expression of MMPs . BRAF mutations are common in papillary thyroid carcinomas (PTCs). By affecting the expression of genes critically related to the development and differentiation of thyroid cancer, they may influence the prognosis of these tumors. Our objective was to characterize the expression of thyroid-specific genes associated with BRAF mutation in PTCs. DESIGN/SETTING AND PATIENTS: We examined the expression of key markers of thyrocyte differentiation in 56 PTCs with BRAF mutations (BRAF-mut) and 37 with wild-type BRAF (BRAF-wt). Eight samples of normal thyroid tissue were analyzed as controls. Quantitative PCR was used to measure mRNA levels for the sodium/iodide symporter (NIS), apical iodide transporter (AIT-B), thyroglobulin (Tg), thyroperoxidase (TPO), TSH receptor (TSH-R), the transcription factor PAX8, and glucose transporter type 1 (Glut1). NIS protein expression and localization was also analyzed by immunohistochemistry. mRNA levels for all thyroid-specific genes were reduced in all PTCs vs. normal thyroid tissues. NIS, AIT-B, Tg, and TPO expression was significantly lower in BRAF-mut tumors than in the BRAF-wt group. Glut-1 transcript levels were increased in all PTCs, and additional increases were noted in BRAF-mut tumors. In both tumor subsets, the NIS protein that was expressed was abnormally retained in the cytoplasm. BRAF V600E mutation in PTCs is associated with reduced expression of key genes involved in iodine metabolism. This effect may alter the effectiveness of diagnostic and/or therapeutic use of radioiodine in BRAF-mut PTCs.